News Team ROCOL take the Leeds 10K Corporate Challenge! ROCOL participated in the recent Leeds 10K Clarion Corporate Challenge on Sunday 12th July. The event, in its 9th year, is part of the Asda Foundation Leeds 10K. 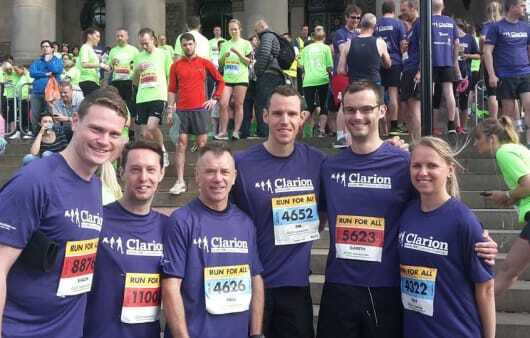 Sponsored by Clarion, the challenge brought businesses from across the region together to compete in teams, taking part in West Yorkshire’s biggest run. This years event attracted a record number of runners- with over 850 signing up as part of 86 teams that entered the race. ROCOL took part in the event, raising money in support of Martin House Children’s Hospice. Their aim is to provide family led care for children with life-limiting conditions. It is a place where children, young people and their families can come to stay from time to time along their journey and find support, rest and practical help. Tim Parish, part of Team ROCOL said: “Although ROCOL have a large global footprint we are a Leeds based business and have many customers in the Yorkshire region. We feel it is very important to support and get involved with local businesses and charities alike. That?s why our team of 7 are running in support of Martin House Children’s Hospice, a Yorkshire charity that we have supported in previous fundraising events. Martin House is a fantastic charity that provide care and support to children and young people with a life-limiting illness and their families”. Team ROCOL performed exceptionally well in the race, finishing in 17th position. It was a fantastic performance from the team, with everyone completing the course in less than one hour. Production Cell Leader, Paul Nugent, recorded an outstanding time of 39:26 minutes, finishing in 15th position overall! Well done to all who participated and thank you to everyone for your support at the event! ROCOL are proud to have raised a total of £285 for Martin House! A massive thank you to everyone who participated, supported and donated for this great cause! If you would still like to donate, we are still collecting for a limited time! Please visit our Just Giving webpage.